What do Arzest, ChunSoft, Good-Feel Co, Mitchell Corporation, Prope, Skip Ltd, Vanpool, NdCUBE and Nintendo have in common? 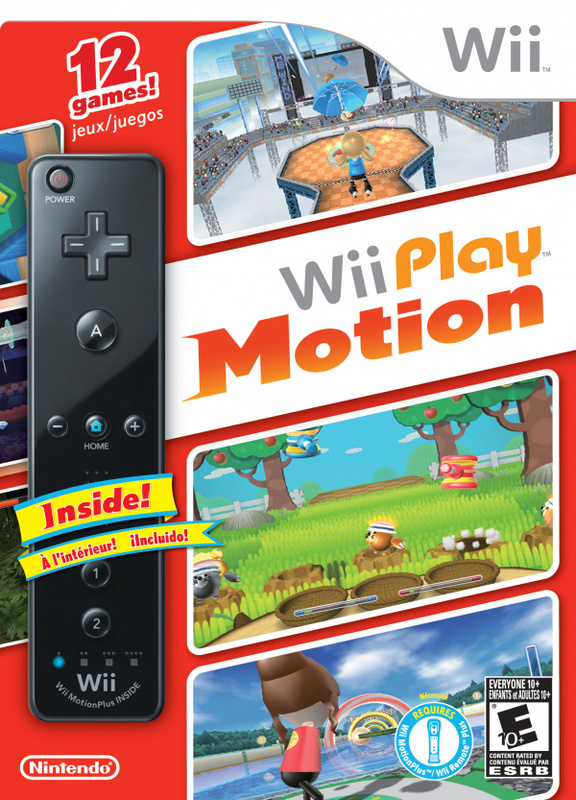 They all worked as developers on Wii Play: Motion, which acts as a companion to the Wii Remote Plus. 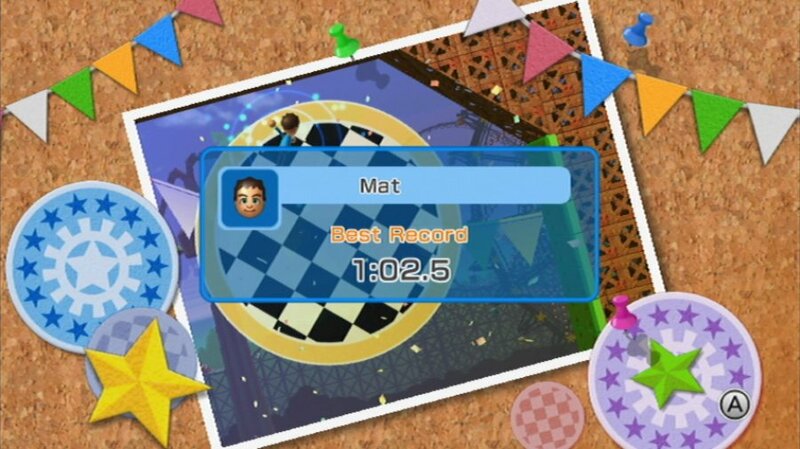 It also serves as a sequel to Wii Play, a compilation largely criticised for its mediocre mix of simplistic mini-games. But with nine teams designing its successor, including former Sonic Team leaders Yuji Naka and Naoto Ohshima and the company behind 999, success is guaranteed, right? As it turns out, it's not. The game has one thing going for it: the 12 activities on offer stretch the creative boundaries more than the table tennis, air hockey and ping pong of its predecessor, and by and large show off what the more accurate controls are capable of, yet at the end of the day still feel thin and underwhelming. There's some fun to be had, however, and we'll start with what we consider the most creative use of MotionPlus, the Prope-developed Trigger Twist. It's by far the smartest take on the shooting-gallery formula we've seen as of thus, having you point around your person instead of exclusively at the screen itself. The front of your Wii Remote becomes a sort of camera, your TV displaying what you're pointing at; your target might be to the left of you, so you'll have to point to your left, your view swinging to display what your Remote is now sighting. You'll initially find yourself inclined to point back at the screen when your intended prey appears there, but after you get used to the unique interface, it becomes one of the most immersive experiences we've seen in the subgenre. Unfortunately, there are only four levels – UFOs, ninjas, dinosaurs and all of the above – and while they each feature progressive stages, including one where you're asked to save fleeing Miis from their attackers, it's just not enough. It's certainly fun to return to, and you can bring a friend along to help out, but like just about every other segment of Wii Play: Motion it feels like the foundation of a bigger, better game rather than a stand-alone activity. Another interesting mini-game is the Ghostbuster-influenced Spooky Search, which again asks you to point at certain spots in your room rather than exclusively at your set. This time it's to locate and capture ghosts that have flown out of your television, using the Remote's speaker to hear a buzzing sound that acts like a metal detector emission representing how close you are to your target. 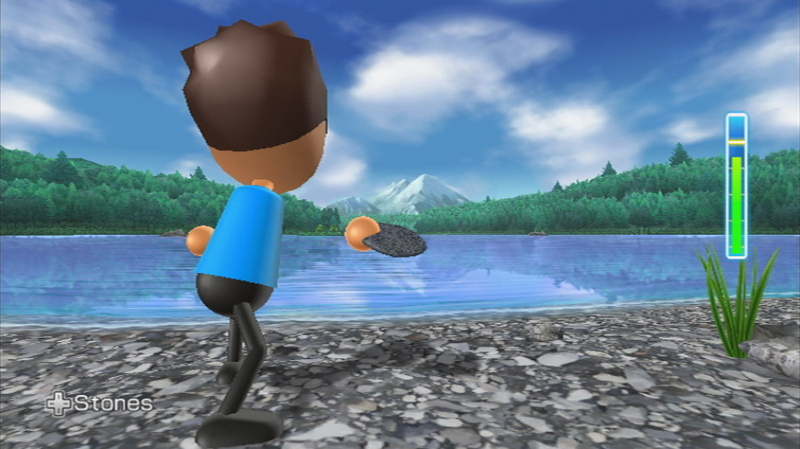 Miis on screen point behind you and say "To the left!" "So close!" and the like to guide your aim, and sometimes find themselves in a bit of a poltergeist situation you're to sort out, quite the charming touch. The two-to-four player multiplayer mode adds a bit of teamwork-oriented fun, tasking you with working together to rope in the big baddies, who put up a fight and force you to swing your arm around to draw them into the ghost trap at the centre of your screen. This activity gives you three levels to choose from, the last one culminating in a boss of sorts – really just a very big ghost, nothing too unique – and that's, once again, not nearly enough to make this feel like more than the foundation of a good game. It's fun enough to come back to, but its limited sense of progression and variation will keep it from hooking you for long. Another letdown is that it's just not as creepy as it could be – those scrambling Miis are cute no matter how spooky of a mansion they inhabit, and listening to an electronic noise from your Remote rather than a whispering ghost removes you one step further. Relying minimally on visual cues and depending on audio instead to build the ambience is an ambitious task, one at which Spooky Search falls short. Treasure Twirl provides another great cooperative multiplayer mode, where you and a friend each pull up one side of a steel treasure-containing basket, avoiding obstacles and enemies along the way, and it really proves a formidable task to slow down and speed up both for yourself and your teammate and feels like you've really accomplished something by the time you reach your goal with as few spoils spilled as possible. Single player has you venture down and back up alone, picking up jewels, chests and oxygen tanks as you go and watching your health/air metre so that you surface alive. Again, enemies block the way, making you drop your booty as well as a few bars of life upon collision. You control this mode with the Remote held sideways, and good luck finding a way to wrap up that strap so that it's not flicking your wrist with each spin. All in all this too is a fun and challenging mode, but once again it's sadly limited – Solo contains four levels while Partner Mode features a miniscule two. They vary in complexity enough to make each unique, but there's just not enough here to hold one's interest past a few high score attempts. 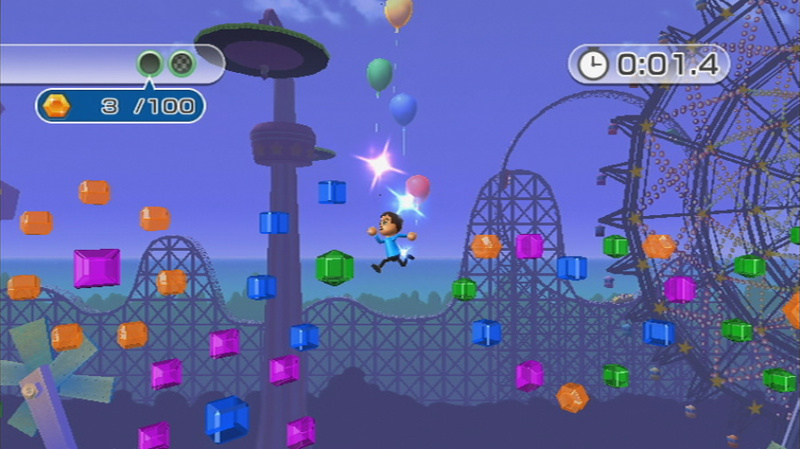 Jump Park provides another mini-game that's fun for one or two players, challenging you to collect gems while bouncing around and controlling only your body's orientation as mapped to the upright Wii Remote and the ability to give your leap an extra boost with the press of a button. Cooperative mode has you and a friend make one capital I-shaped mass, taking turns as to whose feet land on the ground. While not as dependent upon teamwork as Treasure Twirl or Spooky Search, this provides a good way for two to work together as well as a fun and challenging task to accomplish. Unfortunately, once you get the hang of it, it goes by quick – while unique, there are once more only four stages total. You're probably getting the gist – fun enough, but too few levels. You'll be happy to hear then that two activities offer a whopping 30 stages each. The first is Teeter Targets, which has you turn the Remote sideways to control flippers weighted at the centre to toss a ball bearing about. Challenge Mode has you aim for a series of targets in the somewhat increasingly complex aforementioned stages, but smart puzzle design is hard to come by here and you'll have no trouble getting through the majority of areas in short order. Versus Mode has you and a friend aim for sets of targets on the same stage, though there are only four available, and Endless presents three challenge levels that have you bounce your ball in specific ways for as long as possible. All in all, it's too simple and limited once more, though it involves enough skill to provide some replay value. The other 30-level activity is Star Shuttle, and it's got the most niche appeal of the bunch. It tasks you with landing a spacecraft onto a larger floating body, attaching a piece of equipment at the correct spots. What makes it interesting is that you must steer with a series of blasters on all sides of your ship with the direction pad, A and B, turning it about with the Remote. Some of the machinery you'll have to place on-target adds another challenge as you'll have to point your Remote in non-intuitive ways to make the landing, thus changing which blasters are pointed where. There's also the occasional space storm to ride out, performed by pointing the Remote at the screen, and some obstacles to avoid, and if you go too quickly you'll crash and have to start over. Your greatest enemy is the floatiness of space itself, making handling extremely loose and somewhat frustrating. It tasks you with using a gentle touch, but combining this with the already purposely cumbersome controls makes for a bit of a headache. If you're looking for a workout in patience, then, this is perfect, though most will find it too slow and awkward to return to much. The relative multitude of levels is misleading as well, as while they progress in difficulty they are very similar. 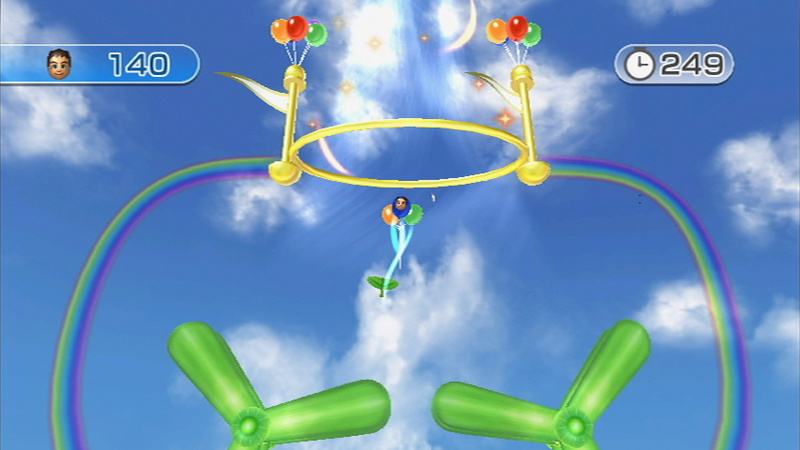 A two-player mode is included, but it simply tasks you with landing your equipment before your opponent over nine stages. This is one of ChunSoft's contributions, and we hope that Nintendo allows them to stick to game novels from now on. Wind Runner could most easily see use as the foundation of a longer, more complex title, and is thus especially disappointing in its limitedness. It has you race down a track pointing your Remote in the direction of the wind, catching gusts with an open umbrella and hopping to avoid oil spills as you pick up gems. There's a solo and two-player versus mode, the latter of which has you complete the track before your opponent, as well as Long Jump and Time Attack. There are only three racetracks, however, and each is increasingly complex but too simple overall for much lasting fun. A larger, more diverse set would easily provide the basis of a quality game, and what's here is fun enough – it just, once again, is not enough. Flutter Fly could easily fit into a fitness title as it'll give your forearms a work-out. You must send balloons through a track by fanning them with a leaf, moving your Remote around to all sides to achieve the correct direction. There are some obstacles like birds to zap, but largely track design is unimaginative. There are four for Solo mode and one for two-player Versus, and like a broken record we must criticise the game for including too little and too minimally fleshed out of a potentially good thing. Veggie Guardin' is a virtual whack-a-mole game, a bit simple for 2011 but still surprisingly fun. Miis pop out to trick you and adorable gophers wearing Mii masks add personality to the mix. Single-player culminates in a big boss battle, though it's not terribly long before you get there. A versus mode for two to four has you compete for points, and Recall mode has you bop the varmints in a specific order, remembering how they popped up before. All in all it's quite entertaining, especially with a friend, but we'd have liked to see a longer individual adventure. Pose Mii Plus will look familiar to anyone who's played ThruSpace, asking you to turn Miis in correct directions to fit through silhouette-shaped holes. It's simple and challenging, and again might compel you to return, but such a non-complex task only holds so much replay value as it doesn't get much more fleshed out than that. That leaves but two, and we've saved the most simplistic for last. Cone Zone has you pivot your Remote to balance gigantic helpings of ice cream scoop by scoop in one mode, playing alone or competing with a friend, and while it doesn't require a lot of skill to swing a Remote back and forth with accuracy, it's still fun to see who can get their dessert tall enough to reach the cosmos. There's also Swirl Mode, which has you twirl your Remote to evenly stack up some soft-serve but without much chance of getting it to any remarkable height. This is quite tedious and only available for individuals, so you're not likely to return much. Lastly is Skip Skimmer, where you skip stones across a lake either alone or competing with one to three friends for distance. It's quite relaxing, and the inclusion of special rocks that bark, meow, shoot lightning, drop feathers and more makes for a charming addition. There's also a Score Mode that has you launch your limestone at a target, again for one to four players. It's entertaining but limited once more, and once you get the hang of the somewhat temperamental controls you stand to have some fun with this simple, skilled activity. At the end of the day, it just doesn't feel like enough. The activities included here would feel more at home in a set of 50-100 in a game like Wii Party or as the foundation of bigger, more complex titles. When it shines in cooperative multiplayer or control innovation, it does so brightly but briefly. What replay value it contains lies in the leaderboards, but these are poorly realised – you're only given a list of the top three, and the game only keeps track of one high score per user. As you would expect of a Wii series title, presentation is clean, simple and attractive. The water and sky of Skip Skimmer looks quite beautiful and match the time of day at which you play, the gophers of Veggie Guardin' are charmingly animated and the storybook look of Teeter Targets is quite nice. The developers also make great use of the Wii Remote speaker, as in the aforementioned activity when balls clink and clack onto the paddles you're controlling and you hear it in the palm of your hand. The music is largely simple and well-composed while unmemorable, except for the obnoxious, repetitive score of Teeter Targets which you will mute almost immediately. 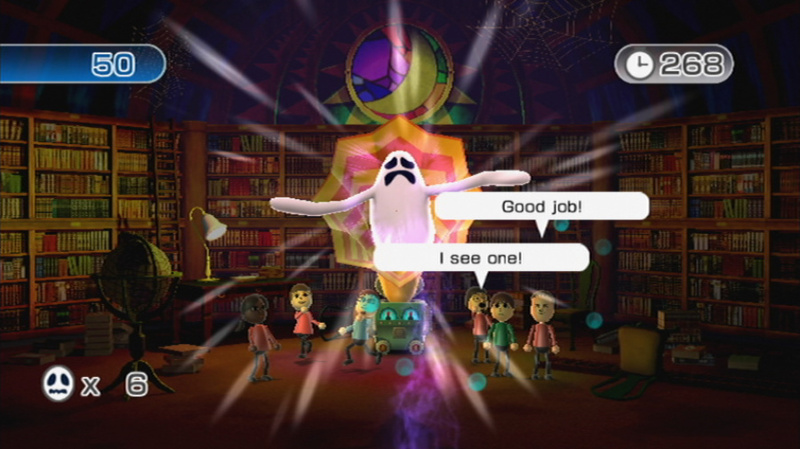 The game controls quite well and with precision and creativity, showcasing the Wii Remote Plus quite nicely. The 12 titles on offer in Wii Play Motion surpass their predecessor in creativity but are just as mediocre in their simplicity and limitedness. Each activity feels like it could be so much more, either as a smaller part of a larger mini-game compilation or as the foundation of a full, unique title. Nintendo has said recently that it wants to work more closely with third parties, but here it's taken eight of them and together created what amounts to about half of a game. There's enough fun to make for a decent experience and Prope's unique contribution of Trigger Twist is not to be missed, but all in all this is just as mediocre as its predecessor. 6? Ouch. I'd give it an 8. Looks fun enough. I might pick it up, as I still need a motion plus for Skyward Sword. Wait, Mitchell was involved? I love those guys. Now I feel the need to get a copy just out of respect for that team. @Whoever does the banners for these reviewed games probably should use a different color font for the title, as I could not read what it was with the white background. Just thought I'd let you know. I hope Nintendo makes a "3DS Play"
Hmm, I was hoping from the previews that it might have been something special! If I didn't have 2 WM+ already I'd grab this, but I think I'll give it a miss. The only games I really liked were Teeter Targets and Pose Mii, but I tired of those quickly and wound up selling this game. 6 is right score for this. I´ve played it and never gonna buy it. I just want to play quality games on my Wii like... er... Brawl. Anyways the parasol racing and Skip Skimmer were fun to play for a while. It´ll come out in 2014. Years too late like this game. I agree with pntjr. This game deserves an 8 easily. It's a blast to play with a group of people. It also does a nice job of offering a wide range of skill level needed for the different games. This makes it perfect for a family gathering or with a group of friends. Very creative uses of the Wii Remote Plus. Personally, I am very happy to have this game in my collection. 8? More like 10. Clearly a masterpiece, a classic in the making, a cult hit. There exist not enough superlatives in the world to describe this title. Well the predecessor is one of themost underrated titles in the wii library imho! It was immensely addictive. This doesn't have the same impact in me as its predecessor, but most of the mini-games I would rate at 7 even 8/10. I think two I would score at 6 and 5 out of ten. So overall, I'd give it a "high 7" out of ten. Its not in the same league as Wii Sports Resort but its a very good accompaniment to that game and its miles ahead of the vast majority of the mini/midi-game compilations on the Wii. The red wiimote plus is lush too! Just as expected. More shovelware. This is being called the best party game on the Wii in customer reviews. High praise. These are the games you bust out with friends and family. People reviewing it as a solo experience are missing out on a lot of fun. I used to despise these types of games until I realized what an event they create in your living room, or even a friends' living room. Gitcher headoutta yerbutt, and give it a spin. Its not a full retail game. Why criticize it then for being half a game? Some of these games look really clever, hopefully they implement them in skyward sword or something. @Kevin This is not shovelware, shovelware games are much worse than this, examples of shovelware are the likes of carnival games, big beach sorts, the imagine series etc. Combine the comments of 15 and 16 and you'll see why 8 is probably a better score, though I should check what the first game got b/c this is at least 100% better than the first game. Despite all the collaborators on this game it comes across much more as a Sports Resort sequel, it's cohesive, unlike the first games slapped together crapfest. The fact that it still cost only $10 (minus the Wiimote Plus price) and the review was as long as it was, almost all negative comments were about how there weren't enough levels, but it's a $10 game. Compare this to any Wiiware 1000 point game. I got this w/ Flingsmash for $60, so $30 each, which made the games sorta free, and I traded in my 2 original Wiimotes and 2 Pluses (from Sports Resort 2-pack) and I really like not having the adapter on when changing batteries,and the black is much better than 4 yr. old white (now kinda gray) Wiimotes. OK that last part got rambling, but my point was I'm glad to have this game even already having 4 Wiimotes. The title and rating say it all. This would have been a great game if it had more content and came out right when the motion plus came out. Also I think it would have helped sales to include the red controller in the US bundle. "Nintendo has said recently that it wants to work more closely with third parties, but here it's taken eight of them and together created what amounts to about half of a game." ...and sold if for 1/4 of a game. Buying this means spending about 10€ more than for the "naked" Wiimote. Less, if you catch a good offer. I rather liked the mini games in this. Every game has little twists and is charmingly and for the most part flawlessly executed. It's not a game you'll want to play alone all evening. It's the perfect game to play however, when "non-gaming" people are around. It's absolutely worth the small premium compared to the standalone Wiimote. That is, if you're looking for another Wiimote in the first place and have use for a charming "expanded audience" mini-game collection. The game is $20-35 depending on the retailer without the Remote included. The package is just a good deal. To clarify, limited content doesn't just mean that there's not a lot of it, it means you won't get a lot out of it. A good budget game should be fun enough, albeit simple, to return to time and time again. This is the difference between, say, a Boardwalk Ball Toss and a Delbo or QuickPick Farmer. I mention which activities are worth returning to here, but there's just no or little lasting value to most of these minigames. I also tried the game out with others and commented on what benefitted most from multiplayer. 6 equals decent, not bad. The review makes it remind me of Wii Play. One or two really good games but the rest are really lame. Air Hockey is fun, Shooting Gallery is fun, Tanks is fun and that's about it. I only got Wii Play because we had just gotten our Wii and they were sold out of Wii Remotes by themselves. I don't need a wii remote, so I'm not getting this. I could go play a quality game like Wii Sports Resort as a party game or even something like Brawl or Mario Kart Wii. It looks fun as a party game but I just don't need another "party game". Not interested in party games. @ZachKaplan: Which retailer is that? Amazon.com has the game only listed as packaged with a Wiimote+ for about 50$ as far as I can see. As has ToysRus. If Nintendo's official site for the game is to be believed ("includes a Wii Remote Plus Controller"), it should be only available in this form at retailers. So, for all intends and purposes, this is a 10$/€ "bonus" that comes with a Wiimote+ and should be rated/reviewed with that in mind. As such, the package is not a good deal, but the only regular way to get this. Whoever paid more for the game alone - whichever way they got it - has had themselves ripped off, I'm afraid. NGamer gave it 72, although, whilst it gave The Grappling Ghost's Minigame 88 (Wow) being the highest scoring minigame on the disk, it gave Flutter Fly 30. 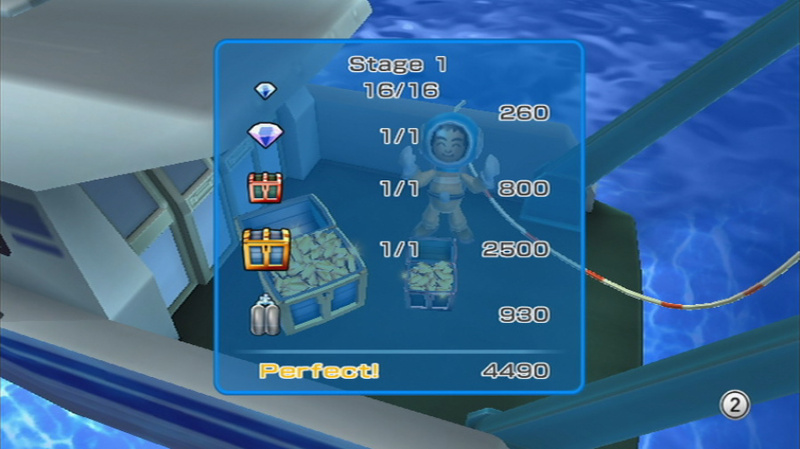 Seems like the minigames ranged quite drastically. Basically, Ngamer said that Nintendo had made some great games from really unusual concepts, whereas some were too unusual to work. I'd put it in the 7-8 range. Our playtime, which is often the best judge, is already 2x what we got out of WiiPlay. This one has more variety and more 'great' games, but again is much more a multiplayer game. Playing solo will leave you wanting. I often think we need a GROUP review for multiplayer games b/c when one person reviews a game you usually get a review that has come mostly from single player play. As a group game WPM is not as good as Wii Party in my book (which btw is excellent), but it is a great game in its own right. It is VERY easy to pick up and play, the sort of thing I can have my kids play with my parents and everyone is smiling and having fun. For that reason alone it is worth the money . As many multiplayer Wii titles as there are, most of them either have spotty controls (Mario & Sonic titles for example) or are too complex for non-gamers (NBA Jam). WPM is really a nice little game for group gaming, especially for playing with your non-gamer friends. I would only ever pick this up should I need another WMP. I really enjoyed Wii Play because it was a fun game to introduce video games to non-gamers. 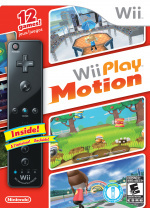 Everyone I showed it to had lots of fun with the game and I've been looking forward to Wii Play Motion. My problem is that I just don't have a need for another controller so it's hard to justify the $50 price. I just found an email from Nintendo I received in June that will allow Club Nintendo members (who previously registered Wii Play or FlingSmash) the ability to purchase a disc-only version of Wii Play Motion for $29.99 directly from the Nintendo Online Store. I guess this is what they feel the actual value of the game is minus the wii remote. @Environ: They probably just feel like royally ripping Club Nintendo members off and that's it. Heck, if you buy the bundle and sell the included Wiimote+ on ebay, you should get the game for less as a result. If you have old Wiimotes with Motion Plus addons and have a use for this collection, I'd get this in your place and sell an old combo. You should get about 20$ for an old Wiimote including the Motion+ addon on ebay. This nets you 30$ for a brand new Wiimote+ and the game. If you've already got Wiimote+, this is less desirable, of course. It does have decent replay value. Overall as a social game it doesn't quite rech the heights of wii party and sports resort. What's compelling is the precision element of the wiimote plus. Once u get that into ur head, it actually mostly demonstrates the tech well and in a fun way. Wow, this is pretty cool. 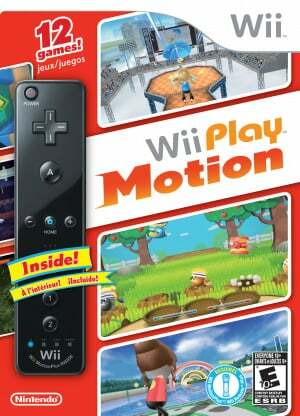 If I had a Wii, I'd definitely get this, Wii Play was awesome. And agreed, I do hope they make a sort of '3DS Play' as well. It could turn out to be loads of fun. Just wanted to point out, Skip, Ltd. is the company behind the Art Style / Bit Generations and Chibi Robo games. we dont need another mario party rip off get a better game nintendo. I might get this just for a controller. I need to get a second Wii Motion Plus controller anyway, why not pick up the game that's only 10 bucks more? These minigames sound pretty boring to me. 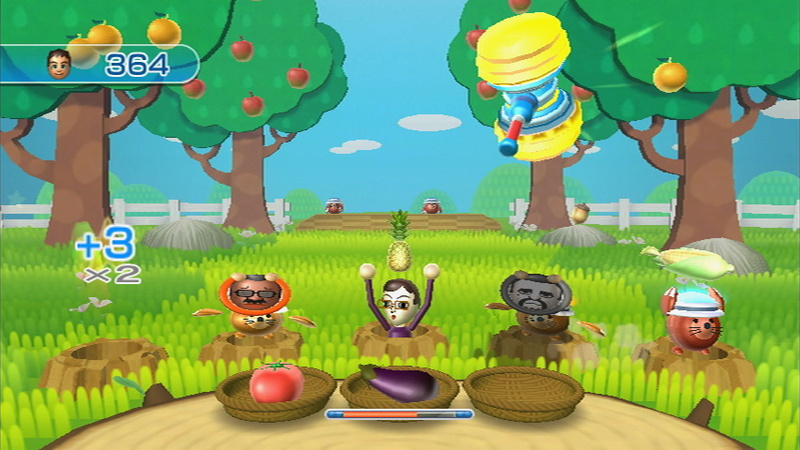 The original Wii Play may have also had just a bunch of short minigames, but at least most of those minigames are fun. Ahhh the Wii. It doesn't have great graphics because graphics don't matter. It doesn't have great online because online doesn't matter. It doesn't have great games because great games don't matter. Why don't you go outside and read a book? Well now that Star Shuttle game sounds interesting, it kinda sounds like Lunar Lander for the Atari. I don't have a Wii Remote plus yet, so that is why I'm considering this game. However that was the same reason I bought Wii Play, and that was not worth the extra $10. I got the Club Nintendo Bundle because WM+ were only going for around $10-$20 or so on ebay for some reason (if they were out of their original packaging) - not worth it after the seller fees. I do feel a bit ripped off though. I haven't really given it a fair shake yet, but I find that the games on the original Wii Play, though simpler, were fun and addictive, and for the most part, these just aren't. For a £5 game I'd say it's pretty good. Just like the original, all the reviewers slammed it but people still bought it and had a great time. In response to those who think this deserved a higher score, I will follow James's example and quote our scoring policy for a 6/10: This game is not good enough to rush out and buy without doing your homework. Whilst you should approach with a degree of caution you might still really enjoy this game. A good example of a six is a lazy sequel, it doesn't innovate but it doesn't really do anything wrong. Other games with a six may be flawed in crucial areas. I stand by my rating as this sums up how I feel about the game. If you state that a flawed title should be given extra points for a low price, my argument is that one might happily buy a 6/10 for $5 or $10 and agree that it's a good value, but it's still a 6/10 regardless. @Zach I liked QuickPick Farmer. "but all in all this is just as mediocre as its predecessor"
Well, that just simultaneously invalidated the review for me and sold me on this game. Wii Play wasn't mediocre, it was exactly the kind of simple yet replayable fun that brought everyone together laughing in the living rooms of my family members, back when the Wii was new and I'd bring mine along for a visit. Wii Sports and Wii Play sold the Wii on people who never picked up controllers, no question, and both were full of charm and polish. I'd rather see a future filled with this kind of thing than with any of the traditional gaming genres, so long as we get the polish of these 1st party titles and not the blandness of Deca Sports and other awful knockoffs. Those are mediocre. @Oddy Me too, I was making the comparison that QuickPick Farmer is a cheap but simple title that maximizes on its simple formula and is still fun while Boardwalk Ball Toss is not. The difference between a too-limited game and one that you quickly forget how much you paid for it. I give it at least a 7. Its a lot of fun when you get a few people playing. Definitely not shovelware. Gotta say, Veggie Guardin' is way more fun than it has any right to be. Needed a Remote Plus, but actually really wanted this game anyway. Passed on the 1st Wii Play. For some reason, the idea of colllaborative design sold me on the collection. Wish each developer had more of a say for how each game looked and sounded, though. I understand Nintendo wanted to unify the whole, but it would've been neat to see Skip's aesthetic choices versus Chun-soft's and Goodfeel's, etc. Whats amazing about this game is how in some of the mini-games the smallest change in angle of the remote (can be only like 10 degrees) can effect the outcome of the mini-game task greatly. Its really actually quite fascinating imho. Its actually also fascinating how the co-ordination of the young 'uns wrt wiimotionplus game play improves the longer they play. Underrated game yet again. After reading your scoring policy again, it could just about scrape an 8 for me. Asking for it for my birthday. I hope it's like Wii Sports Resort and not a demo disc.